BARRY and Marlene Adlard were named the joint recipients of the Derwent Valley Council's Citizen of the Year Award at yesterday's Australia Day celebrations in New Norfolk. 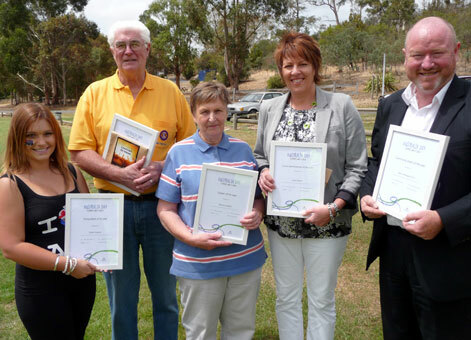 Both are life members of the New Norfolk Rowing Club and long-term members of the Lions Club. Former New Norfolk High School student Caitlin Carnes was named the Young Citizen of the Year in recognition of her role in the organising of events including a business breakfast, careers day and ladies' lunch during 2012. Caitlin was the recipient of a number of prizes at the NNHS awards night last month and will be continuing to college this year. New Norfolk High School's 2012 Rally of Respect was named the Community Event of the Year, with the award being accepted by principal Malcolm Elliott. The rally was attended by an estimated 1000 people including students of all Derwent Valley and Central Highlands schools. Congratulations to all award recipients and nominees.